European countries dominate the ranking and occupy 10 of the 12 places in the category “very high proficiency” and 12 of the 15 places in the category “high proficiency”. 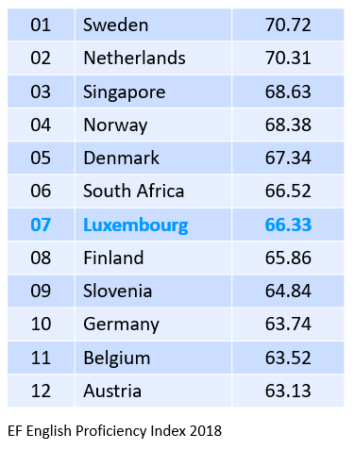 With a score of 66.33, Luxembourg is the 5th best-performing European country after Sweden, the Netherlands, Norway and Denmark. The EF English Proficiency Index is based on 1.3 million test takers in 88 countries.